When you get tired of tanning, swimming, touring historic sites, or any of the other amazing activities St. Simons Island has to offer, consider spending an afternoon shopping. The island is full of quaint shopping destinations, from antique shops to bookstores; you are sure to find something you’re interested in. If you’re searching for antiques, look no further than Oglethorpe Antiques and Interiors. Known as a “must-see” and a “hidden treasure trove”, Oglethorpe Antiques includes pieces from the 18th and 19th century and of English, French, and American descent. There is a good mix of vintage furniture and accessories offered, as well. The G.J. 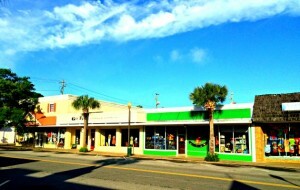 Ford Bookshop is known as the largest independent bookstore on the Golden Isles. Visit to not only enjoy the old-fashioned décor but also to enjoy the wide array of available books. From local interest to classics, children’s to books on tape, a visit to St. Simons Island isn’t complete without a visit to G.J. Ford Bookshop. Aside from boutique chain clothing stores, St. Simons Island has numerous locally owned clothing stores. Cloister Collection offers men and women’s clothing, gifts, and brands such as Lilly Pulitzer, The Sak, and Tommy Bahama. Moondance Vintage Clothing is a unique clothing store offering Aloha shirts and literally one-of-a-kind pieces from the 40s through the 70s. Truly unique, you won’t want to miss a visit here – who knows what you might find! Around the middle of St. Simons Island is the Redfern Village District, the Island’s version of a live/work/play community. Here, you’ll find shops, restaurants, and other interesting storefronts along with a lush landscaped setting. Come here for nightlife, as there are numerous bars and restaurants that stay open late. St. Simons Island is truly one of the best vacation destinations in the south – from beaches to restaurants, historic sites to boutiques, you’re sure to find yourself having a good time.